Have you considered the benefits of backyard fish farming? Fish farming is a very old practice that can be fun, productive and rewarding. As many wild fish stocks are being depleted around the world, fish farming is becoming one of the solutions for a more sustainable future. 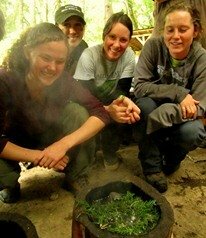 The application of permaculture practices is helping us to utilize fish farms as sustainable food production systems. Permaculture is a practice and perspective of designing systems of agriculture that mimic the relationships found in natural ecological systems. In this article, we will focus on systems based around in-ground ponds for raising fish for food. Though, many of the ideas shared here can be used in other fish raising systems. The first step to start your own fish pond is to pick a location in your backyard that is a natural low spot where water would naturally collect. Envision where your pond will go and draw a three dimensional sketch of the pond. Make sure to include measurements for length, width and all possible levels of depth. It may help to lay out a physical template and dig a line that shows the size and shape of your pond. If you live in an area with hot summers, it is wise to include a deeper area of 8-12 feet as part of your plan - a place where fish can escape during hot weather. This deep area also provides a place for fish during very cold winters. Make sure to include how you will collect the fish into your design plan for the backyard fish farming system. Will the fish be caught by hook and line? Will they be netted individually or in large numbers? How do you plan to access the fish when the time comes to collect them? Adjust your design accordingly, so that you can access your fish easily when it is time to harvest them. If you want to add plants to your pond, consider adding underwater terraces or depressions at varying depths into your pond design where plants can be planted. Plants can help add esthetic appeal, shelter young fish, and some will help oxygenate the water. For more information on which plants area good for ponds, check out our article about Plants for Ponds. When the time to dig arrives, consider what is the best tool for the process of making your new backyard fish farming setup? If you have the room and plan to make a very large pond, or series of very large ponds then it may be best to use heavy machinery such a bobcat or back-hoe. Unless you are very experienced with earthworks, it is probably best to hire an experienced contractor. It can be very helpful to set aside the topsoil, and replace it around the edge of the pond at the end to help encourage more rapid recovery of plant life. Turf can be used in the same way, and can be helpful later on in the process to cover your liner edge. 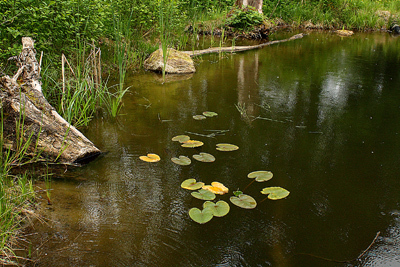 The most common method for making small ponds is to line the bottoms with a waterproof plastic liner. This liner can be spread over just about any shape of pond you can imagine. If you choose to use a liner, set up a buffering material before you put your liner into the pond. This buffer material can be a specially made felt underlayment, or several inches of sand. This helps reduce the chance of your plastic liner being punctured. Keep in mind that the liner needs to be taken care of, and it is best to cover as much of it as possible so as to minimize damage from ultra-violet radiation. To extend the life of your backyard fish farming pond, take good care of your liner. If you want to try another method, there is the option of using sodium bentonite clay. Sodium bentonite clay can be used to make a natural water sealant that will retain water in your pond. The appropriate amount is about two pounds of sodium bentonite per square foot of bare soil , or in other words use a 50 lb bag per 25 square feet. You want to spread it about one inch thick, then till it into your soil. Next you compact this mixed soil with heavy machinery. There are other methods for sealing with sodium bentonite clay, but this is one of the more commonly used. Finally, you can start to fill the pond. You want to be very careful in how you fill the pond up, so as to minimize erosion. You can do this by letting the water flow down a plastic sheet or other surface, so that the water’s movement does not dig through the soil/clay mix. Once done, you can remove the plastic. It is important to test your water quality before you choose to establish your backyard fish farming system. This is especially important both to the health of the fish and to the humans that may consume them in the future. If the pH of the water is particularly high or low, most fish will not survive. Water pH can be adjusted using various commercially available methods, either natural or chemical based. If you want to stick to natural, crushed coral can be used to raise pH, while bogwood or limestone can be used to lower it. Remember, natural methods may change the pH much more gradually. The ideal pH for most fish is near 7, which is considered neutral. Any significant and sudden changes in water pH can be fatal to your fish. Also, if your local water source has a very high level of heavy metals or other pollutants, you should consider getting your water from somewhere else. Some pollutants will collect and be concentrated in the flesh of the fish, so it is vital to have a clean and healthy source of water. Water quality should also be monitored after your backyard fish farming pond has become established. Fish require oxygen to live and some species require more oxygen than others. Species such as trout and other stream dwelling fish require very high levels of dissolved oxygen in the water. Other species such as catfish or carp can handle very low levels of dissolved oxygen. It is important in your backyard fish farming design, to include one or more methods of oxygenating the water. Keeping the oxygen level high will allow for healthy fish, less problems with algae and prevent other problems. There are many ways to oxygenate the water. Fountains are one popular method. Artificial waterfalls, water flow forms, and other water features can also be used to oxygenate the water before it drops into the pond. If you have a steady source of flowing water nearby, you can create a dam and encourage the water through a pipe or weir to cascade down into the pond (as in the photo below). Consider making the flow fall onto a pile of rocks to reduce potential erosion. When creating a good backyard fish farming system, remember the importance of adding structures for fish habitat. Fish benefit greatly from having areas in a pond where they can retreat when they feel threatened. These can be natural structures such as boulder piles, submerged stumps or logs. Man-made materials, such as bricks with open spaces, large corrugated pipes, barrels and other similar materials can serve the same function. Creating places where fish can feel safer keeps them healthier, as it keeps them from wasting energy through nervous swimming. Also, consider what kinds of habitat structures are needed for your fish to nest. Different fish species need different kinds of structures for spawning. For instance, many catfish species nest in hollows or shallow caves. 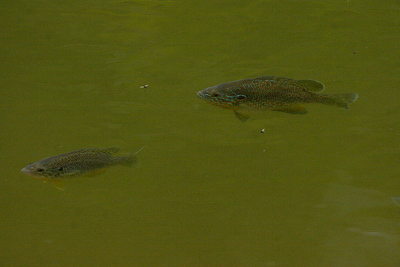 Sunfish, trout and bass use gravel for nesting beds. Carp lay their eggs on vegetation in the shallows. If you wish your fish to reproduce, include the necessary structure. Make sure you choose fish species that are appropriate for your backyard fish farming system. Trout require water to remain high in oxygen and cool throughout the year. Sunfish, such as bluegill or pumpkinseed are more resilient. They are a pan-sized fish that grow fast, reproduce relatively quickly and do very well in many kinds of ponds. Larger, more predatory fish such as bass or perch require more space and more food. Bass are also often cannibalistic and therefore, can quickly eat most of their smaller relatives out of a pond. They are not ideal for most backyard fish farming systems. European carp are a popular food fish in Europe and Asia and opinions about them are changing in the USA. They are omnivorous, adapt well to changes in ponds and grow quite large. Tilapia are another extremely adaptable species that is fast growing, easy to raise and feed. Please respect your local laws about what species to introduce into your pond, as some species such as tilapia or carp may be regulated or even prohibited in your area. If you want to maximize the production of your backyard fish farming pond, you may have to feed your fish. There are a variety of commercially available feeds. Keep unused food frozen to maintain quality. Also, limit your feeding significantly during periods of cold weather as fish tend to be much less active. You can also consider creating habitat for the prey of your chosen fish species, so that there is a continuous supply of wild feed. In larger, well-designed backyard fish farming ponds, wild foods can provide much or all of the food needs of your fish. This kind of setup does not, however, allow for a large amount of annual harvest. Remember, how much you need to feed depends on how many fish you want to harvest annually. If you desire a backyard fish farming pond crowded with fish, you definitely need to do a significant amount of supplemental feeding. When creating a backyard fish farming system, there are some important considerations to keep in mind. Make sure that your pond does not become a source of pollutants such as excess nitrogen or as a source of release for an invasive species. If you keep such species as tilapia or European carp, make sure there is no possibility for them to escape into a nearby lake, stream, river or other waterway. Before acquiring any kind of fish for your pond, check in with your local Fish and Game department regarding regulations and permits. The laws are there for good reason, so please respect and abide by them. Keep an eye on your pond, and if you notice the presence of a highly invasive species of plants or other organism, take the steps to remove and neutralize it. Again, contact your local Fish and Game department for more details. There are a variety of ways to discourage predation. Setting up netting over your pond can keep aerial predators away. For herons, setting up baffle wires, made of thin fishing line can also keep them away. These lines trip the bird up and discourage it from wandering through the shallows. In natural ponds, predators play a vital role in helping thin fish populations by preying on the sick, weak and unaware. In your backyard fish farm, the predators can act in a similar manner by helping keep your fish stock healthy and fit. Predation can also be a major problem under certain circumstances. In shallow ponds, herons can sometimes take a significant number of fish. 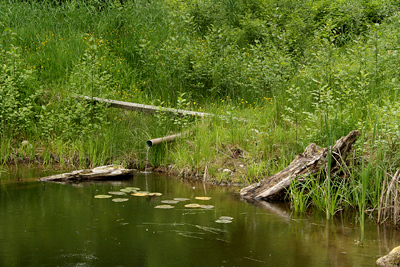 This is another reason to have deeper section of your pond, with hiding places such as submerged pipes, logs, etc. Steep sides of ponds and dense planting of emergent plants can help keep wading predators such as herons out. 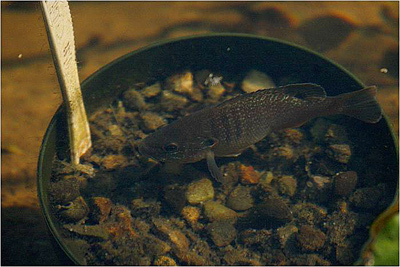 Predation of young fish fry can be approached in a variety of ways. If the major predator of fish fry in your pond is insects, you can introduce a very small species of fish that acts as a prey base for those predators instead of the young fish of your preferred species. This brings us to the idea of "polyculture." Backyard fish farming can greatly benefit from using an approach called polyculture. Polyculture is the raising of two of more different species together that benefit each other. Polyculture is a common practice in many systems of permaculture. This approach has been used in China, Hawaii, and other parts of the world for centuries. The trick is to use several species that don’t compete for the same resources, but that can all be utilized as a resource by humans. Polyculture pond systems need a diversity of small and tiny organisms to provide feed for larger species. This means that in order to be productive the pond needs to have time to mature before it is stocked. Allow your pond to establish for one or more years. Many of the problems faced by backyard fish farming can be approached with creative solutions. One common problem in ponds is excessive algal growth. This is a problem that tends to develop from excess nutrient loads in the water. One natural method for algal control is to encourage algae eaters, such as the tadpoles of frogs and toads. You can encourage these beneficial animals by creating shallows for them to breed in and cover along a pond edge for the adults. This cover could be in the form of rock piles, stick piles, shrubs, logs or other coarse woody cover. Additionally, if you raise tilapia they are algae eaters. They can help keep algal growth from getting out of hand. Consider having several ponds from which you can harvest your fish on a rotation. This would allow for your fish stocks to replenish over time, and also allow you to harvest more frequently. Creating and maintaining a backyard fish farming system can be deeply satisfying, and if done on a large scale can help supplement your income. Your pond can also be an esthetically pleasing part of your landscape. Remember to enjoy the process, have patience and enjoy your harvest of fresh fish!